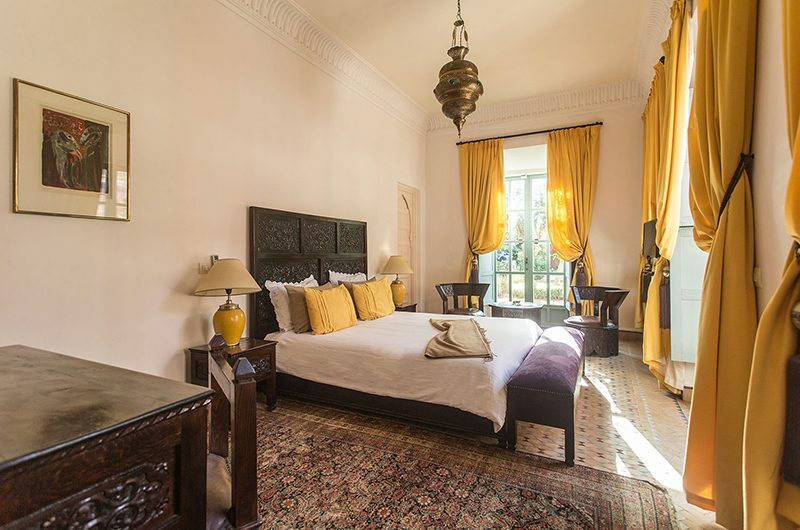 Villa Dar Tana offers a dreamy take on Moroccan living with beautifully styled interiors perfectly matched by scenic gardens built around a private swimming pool. 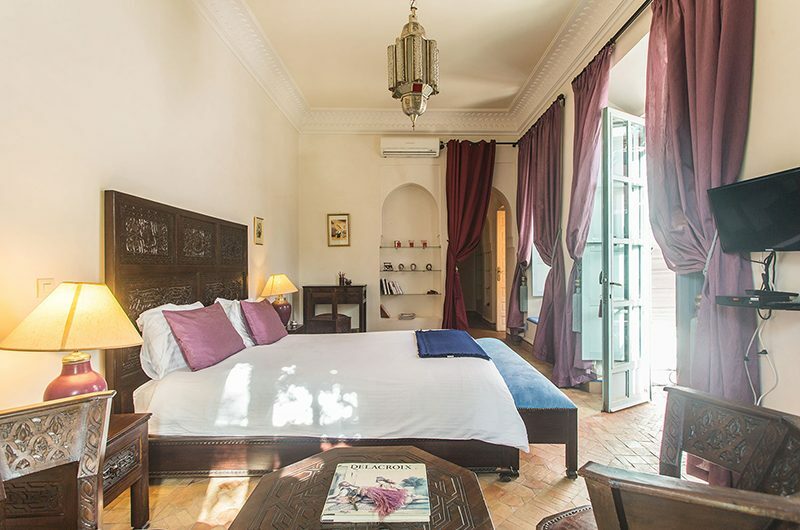 Located within a secure villa estate with access to a shared tennis court and spa, Villa Dar Tana is the perfect place for sun kissed holidays in Morocco with three beautifully appointed bedrooms offering ample room for families and other groups. 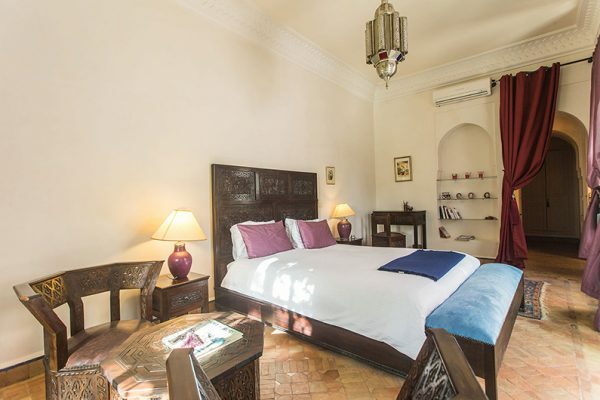 When you want to explore your surroundings, you’ll find the nearest golf course just 10 minutes away while the buzz of downtown Marrakesh awaits within a 30-minute drive. Villa Dar Tana features beautiful Moroccan architecture with exotic interiors and beautiful outdoor lounges to match. 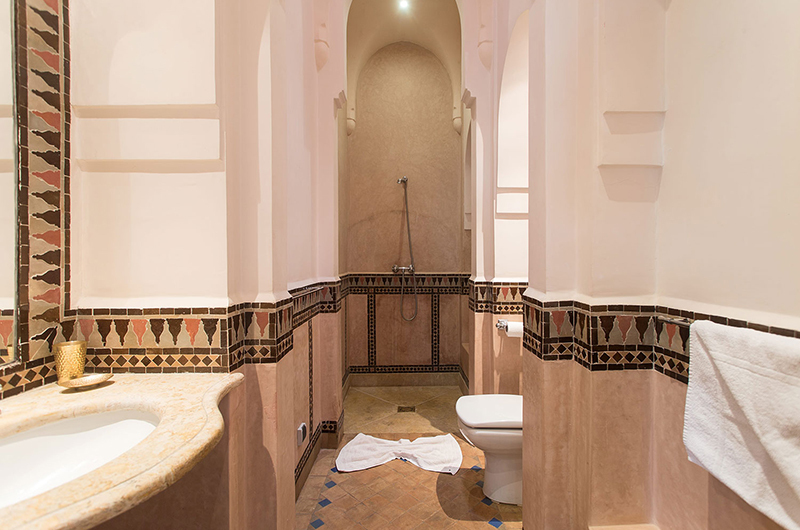 Each of the three bedrooms is paired with an ensuite bathroom mimicking a traditional hammam. 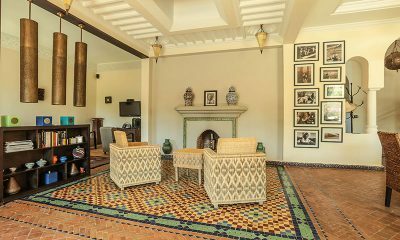 Villa Dar Tana’s living room is styled with exotic Moroccan flair, with a plush sofas and ample armchairs dotted with vibrant cushions. 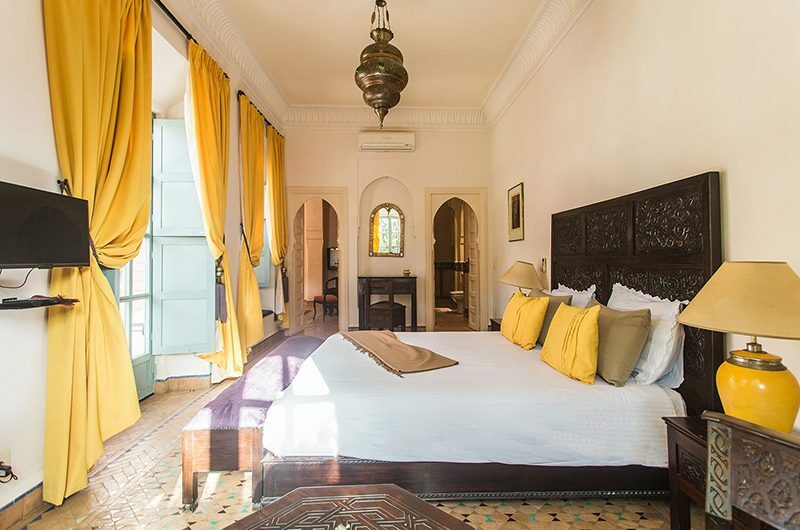 In-villa entertainment is provided by a flatscreen TV, with ornate curtains, a beautiful lantern and Moroccan art adding interest. 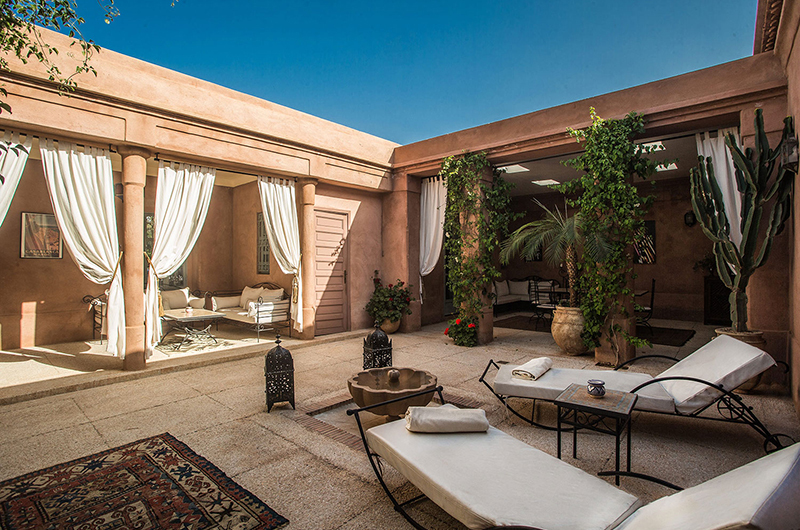 The dreamy outdoor lounge works as an alfresco living room, with ample sun loungers and lounge seating inviting guests in for an afternoon siesta. 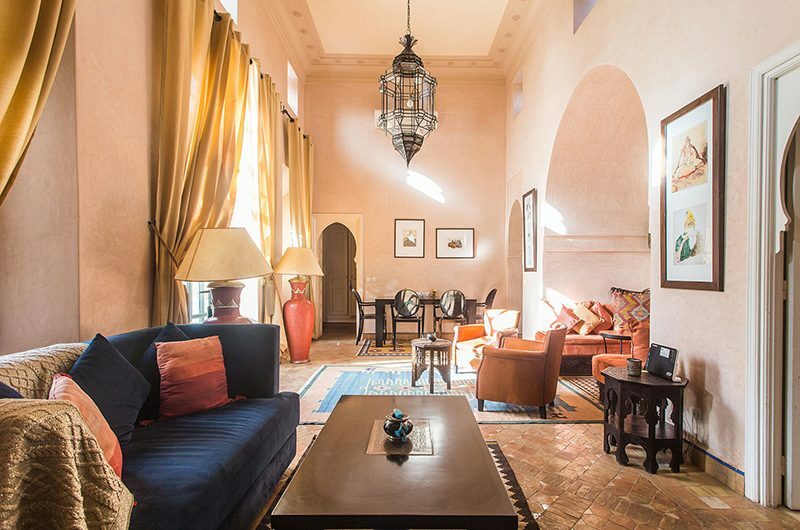 Villa Dar Tana’s six-seater dining table is housed in the living room, with Moroccan carpets and lantern lighting creating an exotic ambiance. 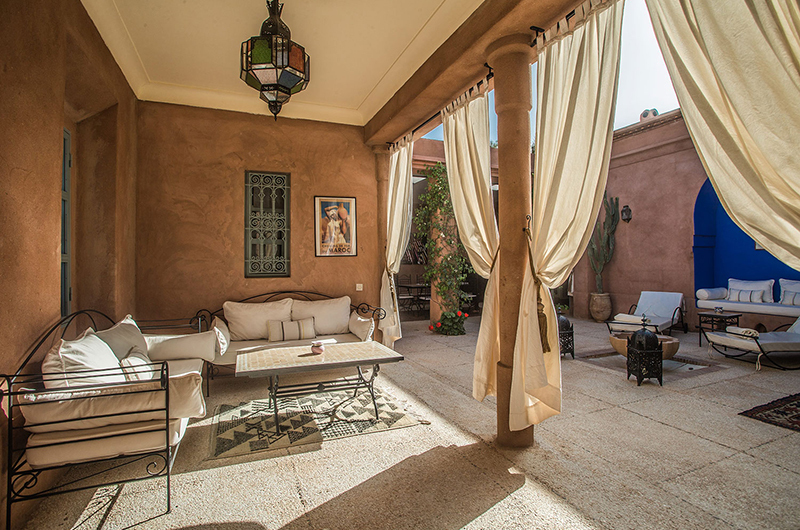 An outdoor dining area is available at the shaded courtyard. 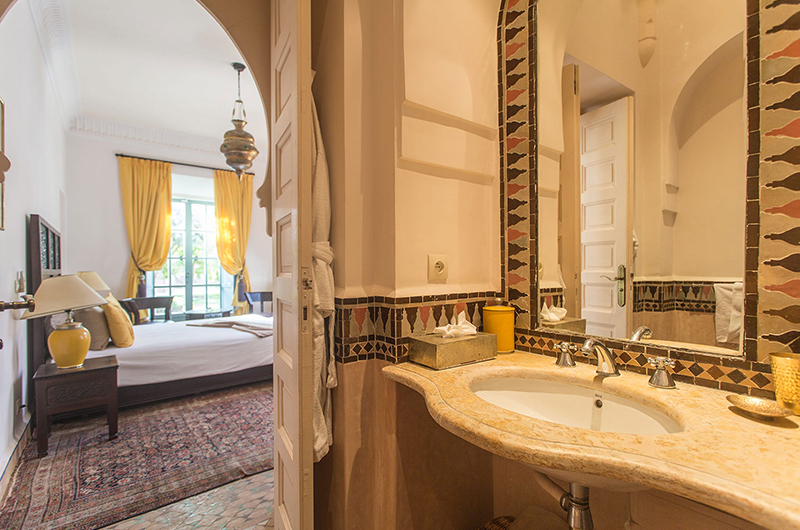 Villa Dar Tana’s riad style swimming pool is enveloped within red clay walls with views looking out to the garden. 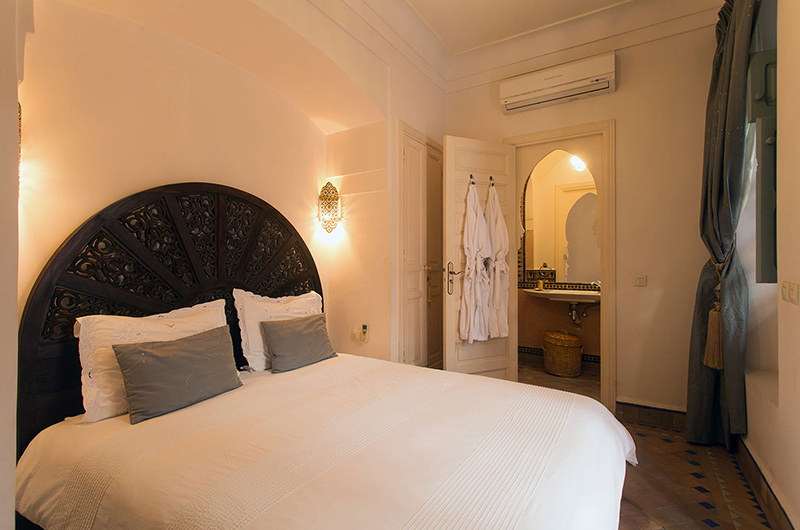 Life at the villa is all about enjoying the great outdoors with ample sun beds and lounge furniture available in the courtyard and in shaded areas behind beautifully bohemian white curtains. 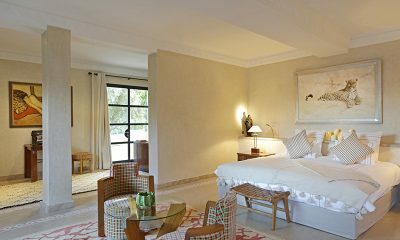 Guests staying at Villa Dar Tana also have access to the villa estate’s shared tennis court. 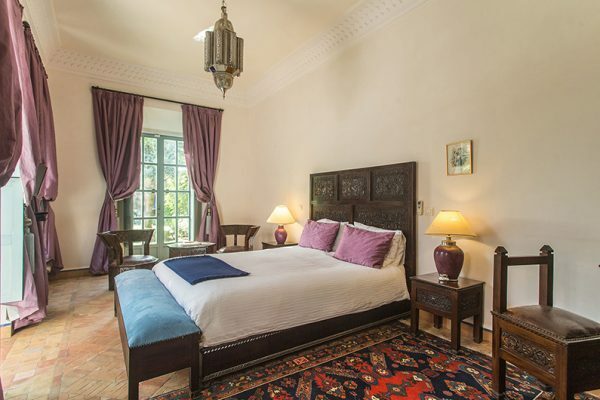 Villa Dar Tana has three bedrooms, all furnished with a king-sized bed and adjoined by an ensuite bathroom. 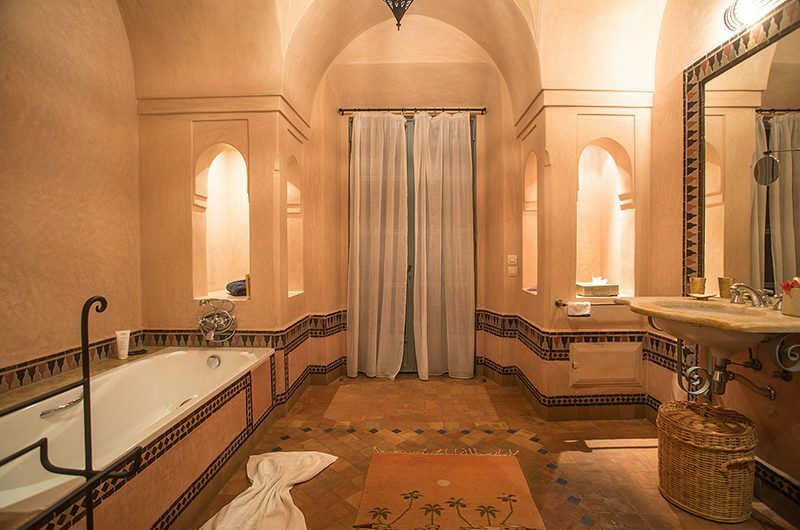 Villa Dar Tana is built over 1,100m2 of land and comprises an open-plan living area, dining room and three bedrooms, each adjoined by an ensuite bathroom. 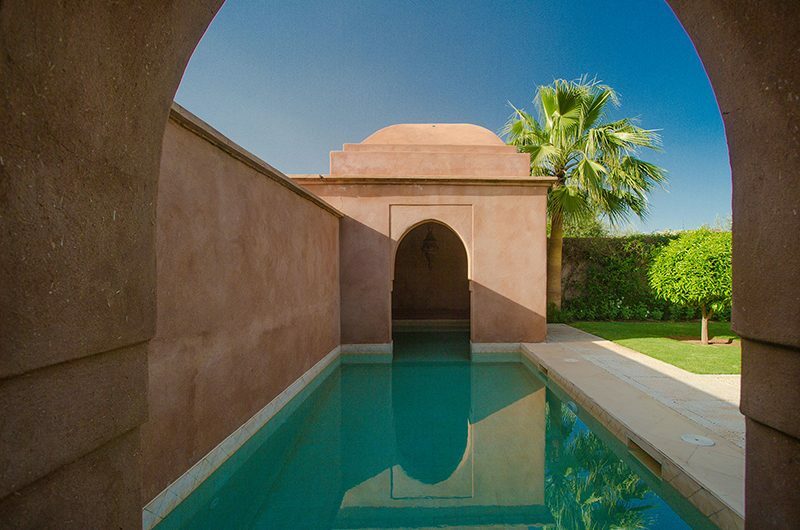 The gardens are built around a 6 x 3 metre swimming pool. 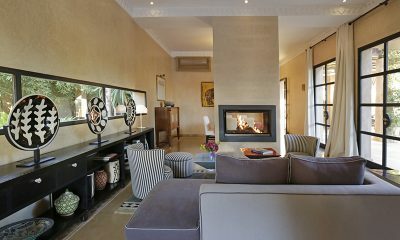 Your stay in Villa Dar Tana is made enjoyable by the professional staff. Villa Dar Tana’s staff have been professionally trained and will do their utmost to please with their warm and friendly hospitality. 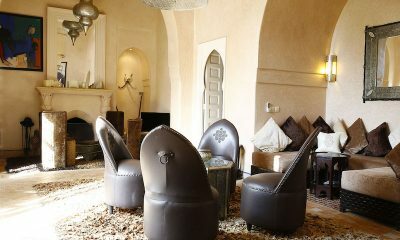 Villa Dar Tana’s experienced and knowledgeable manager is responsible for the overall operation of the villa. 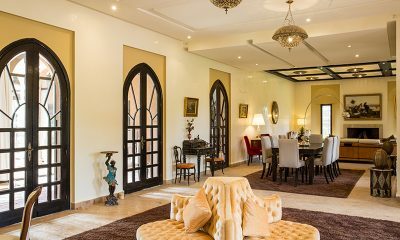 The villa manager will oversee and coordinate the staff and property and assist you during your stay. 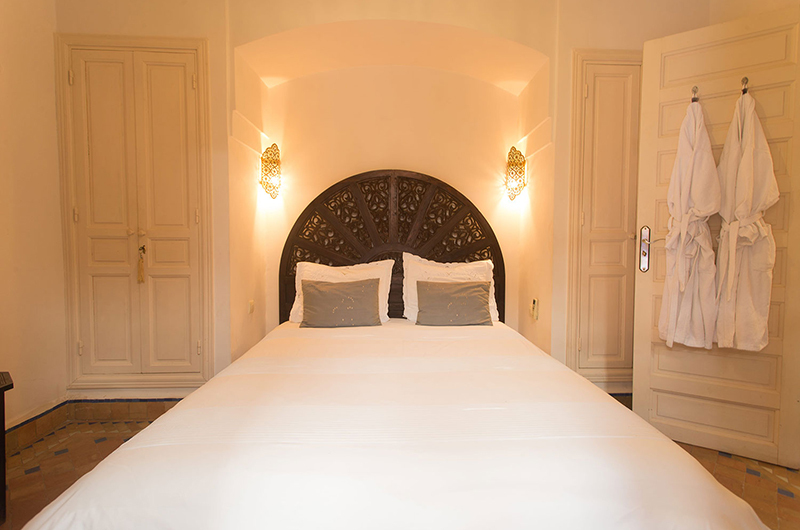 Villa Dar Tana offers half board and all inclusive dining packages. The half board option includes a full breakfast and lunch or dinner. 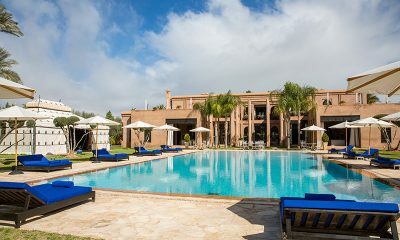 The all inclusive option includes breakfast, lunch and dinner. The villa offers a suggestion menu mainly focusing on Moroccan cuisine and special diets can also be accommodated. 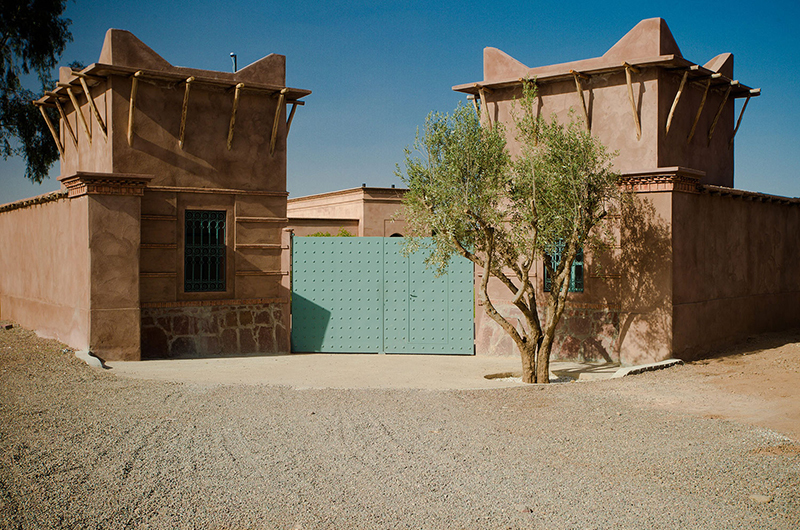 Villa Dar Tana includes 24-hour security. 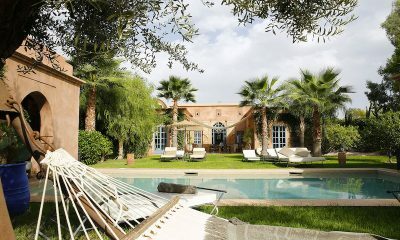 Villa Dar Tana is located within the exclusive Akhdar villa estate just outside the vibrant hub of Marrakesh. 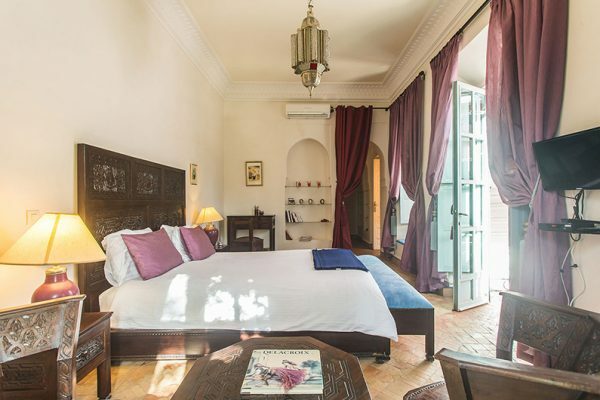 When you’re not busy relaxing at the villa, you can reach the souks, shops, restaurants and museums of Marrakesh in a 20-minute drive. 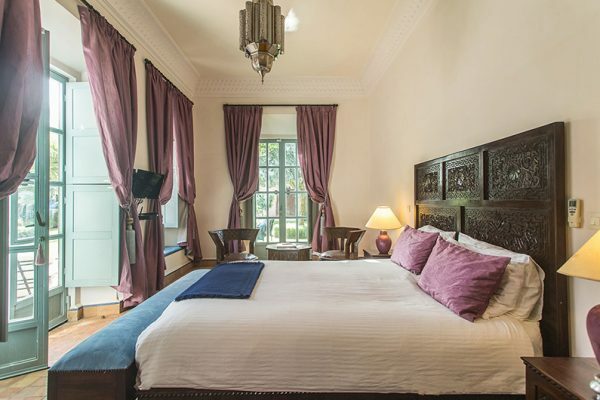 The nearest golf courses are also just 10-minute drive away.